Details will be posted shortly. Blue large scale, stylized flowering vines on linen! An English and American standard of elegance and gentility. 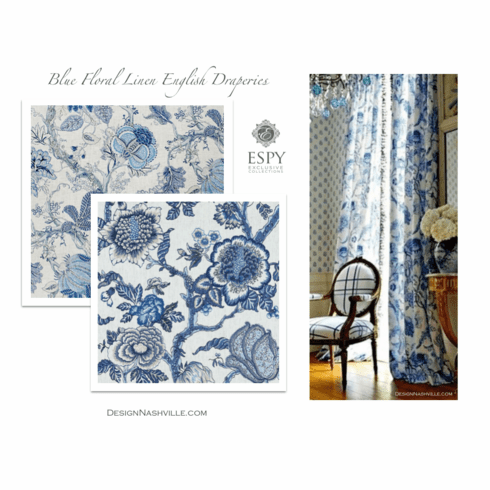 This drapery pair is available in any of the three fabrics shown here. Order SWATCHES and see other items in blue and white below. Decorative trim is optional along the leading edges. Hyde Park is 55% linen 45% rayon with a vertical repeat of 36". Distribution of this fabric is semi exclusive. New London is 100% linen with a vertical repeat of 26". Distribution is exclusive to the interior design trade. Please choose standard or deluxe fullness as well as pleat type. Your drapery is fully lined with light ivory deluxe grade lining. Side and bottom hems are rolled double and blind stitched.